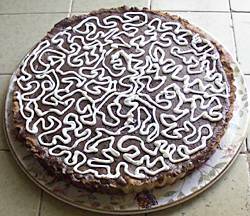 Recipe for cooking a Chocolate Truffle Tart. Looking for a decadently rich chocolate dessert? Look no further than this ultra rich tart. While tart crust is baking, prepare filling. (If you\'ve baked your tart crust in advance, then preheat the oven to 400Â°F. as additional baking is necessary).Â See related links below for Tart Crust Recipe and Instructions. In a heavy saucepan over very low heat, melt chocolate and butter together, stirring frequently. Stir in sugar and vanilla and remove from heat. In a separate bowl, beat eggs and cream with a whisk until frothy and well combined. beat a small amount of the chocolate mixture in the cream mixture to temper the eggs and cream, then stir the egg mixture back into the chocolate mixture and mix until smooth. Pour into baked tart crust, then bake for about 20 minutes or until the custard is just set. Cool on a wire rack and then chill completely before serving or garnishing.